If you’ve ever been to Ann Arbor, this wall mural is hard to miss. Its on East Liberty Street by Potbelly’s and State theatre. 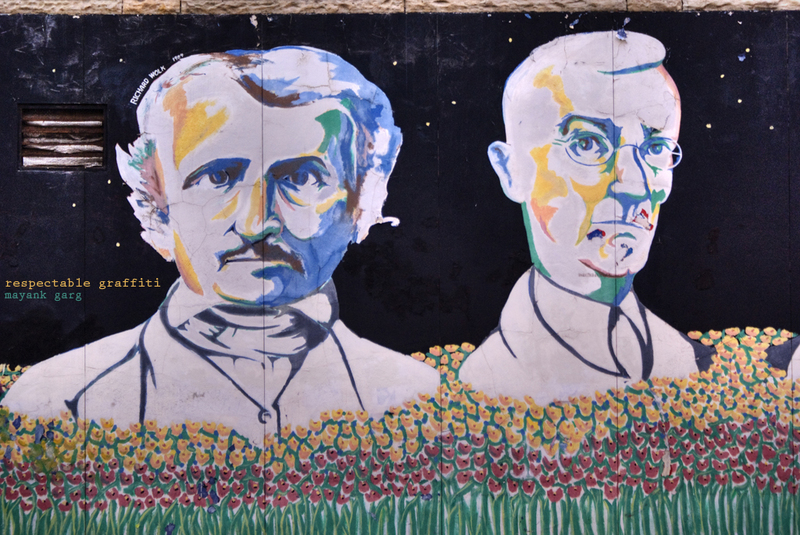 The mural was painted by Richard Wolk in 1984 and the above section shows Edgar Allan Poe (left) and Hermann Hesse (right). I know that graffiti is probably too harsh a word to use in this setting as this clearly is a mural, but somehow to me its ‘respectable’ graffiti. I may be a little sarcastic or I am perhaps just trying to bring out the sophisticated, stern and all knowing eyes with which these gentlemen watch Ann Arbor go about business.